I’ve used the same commercial layer feed since my hens turned 18 weeks old. It seems to work well because my hens lay EVERY day. The shells are consistently hard so I know they are also getting enough calcium in their feed (4%). I do not use a commercial feeder, but rather a small deep metal pan which is attached to the inside of the coop door and raised about 8″ off the coop floor. I’ve watched a lot of chicken videos and I can’t understand why so many people put their feeders on the ground. This allows the chickens to throw out what they don’t want (even though it is ALL the same stuff) and the feed becomes scattered on the ground. This in turn leads to waste and attracts vermin. Furthermore, spoiled feed on a damp/wet floor, mixed with excrement is a recipe for diseased birds and fowl odors which will not make for good relations with your neighbours. My advice is to raise your feeder so that the chickens must reach into the feed. As well, only put enough feed in the container for the day. At the end of the day, put the feeder back in to a sealed container. I use a large plastic container with a sealed lid that holds about 2/3 of a bag of feed. My feeder is stored in that sealed container in my shed. By following these steps, you will definitely help prevent unwanted vermin from making a home in your run/coop and backyard. This in turn will help to keep your neighbour happy and eliminate the need for The Pied Piper to pay a visit to his/her backyard. 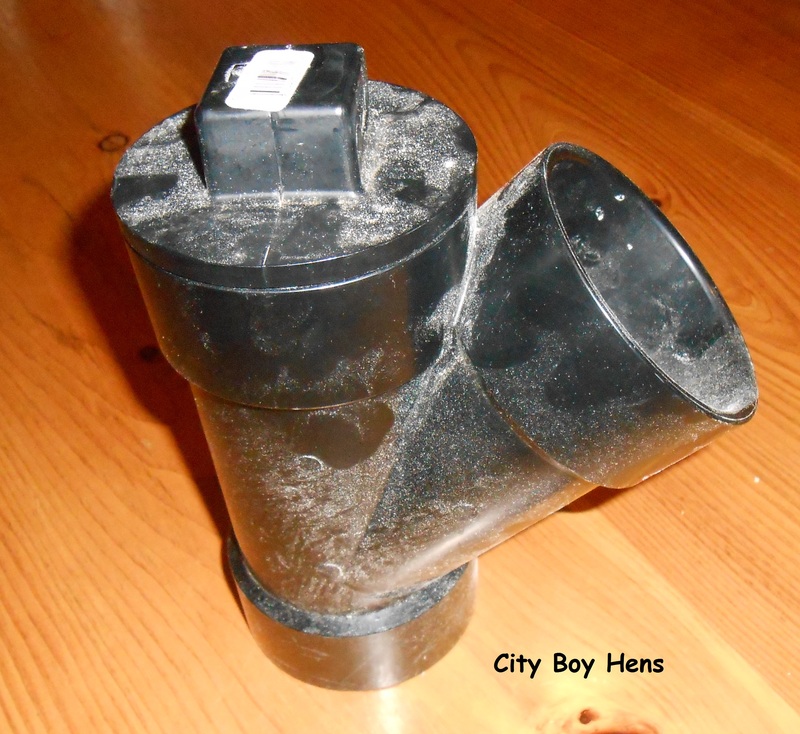 At the cottage…yes we take the hens to the cottage…I use a different feeder that I made from a 3 ½” PVC Y fitting. 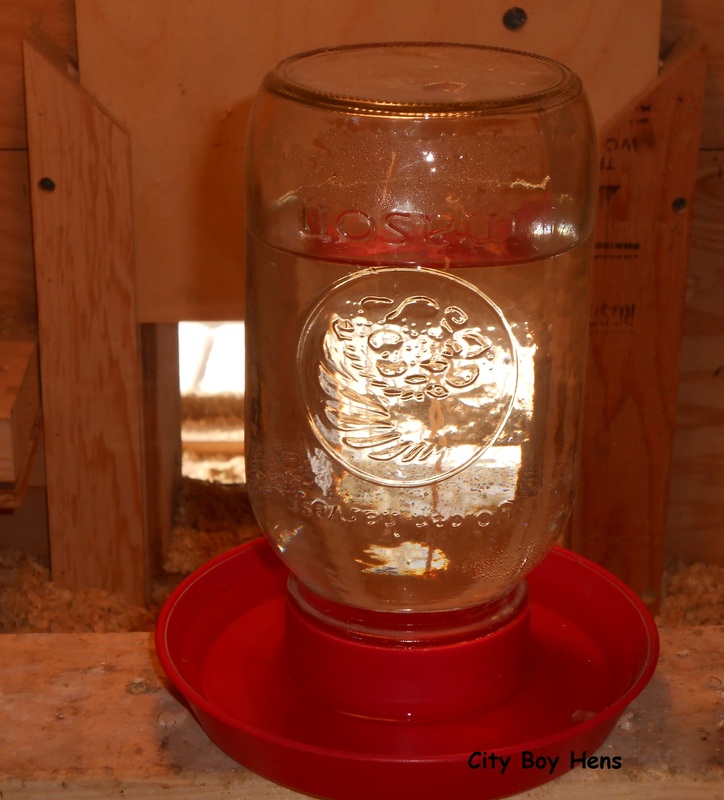 It also works great because the chickens have to reach in to get the feed, which prevents spill or waste. 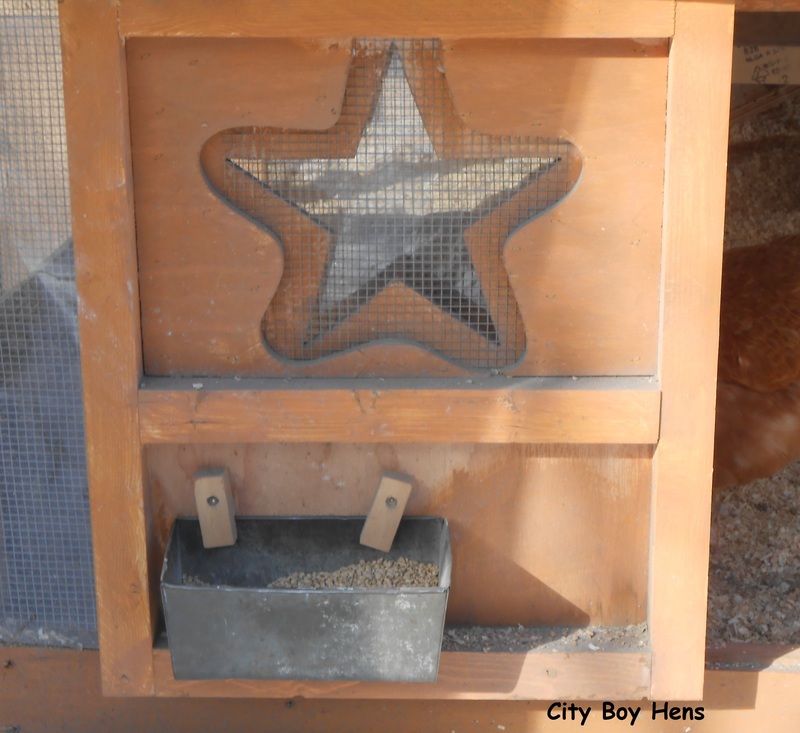 2 chickens can easily access this feeder at once. Build accordingly if your flock is larger. More on making this feeder in another post. Oh….by the way…. I figured out that a standard bag of feed (25 kg/55 lbs) for 3 hens lasts me about 10 weeks. So that’s around 5 bags/year @$15/ea. =$75/year. If your feed supplier is remote, and they generally are for us city “folks”, than make sure to store your extra bags in a metal container (like a garbage can) so that you don’t end up feeding the mice population in your neighbourhood. Fresh water must be given EVERY DAY! If you wouldn’t drink it, why would you expect your hens too, especially when you know that you eat their eggs. I also add some apple cider vinegar to my hens’ water a few times each week. Lots of good stuff in it for healthy chickens and eggs. Like the feeder, I also elevate the drinker. In doing so, I ensure that my girls don’t get any poop or wood shavings in their water. I find that they go through most of a 1 liter mason jar in the summer and less in the winter. This leads me to a problem that we will all encounter in cold climates – How to keep water from freezing. Winters in Southern Ontario fall somewhere in the middle of the spectrum, but it is safe to say that temperatures can stay below freezing from mid December to mid March. During that time, I move the drinker into the coop which is insulated and generates heat via a 100 watt light bulb. Please see my section on the Coop for more details. 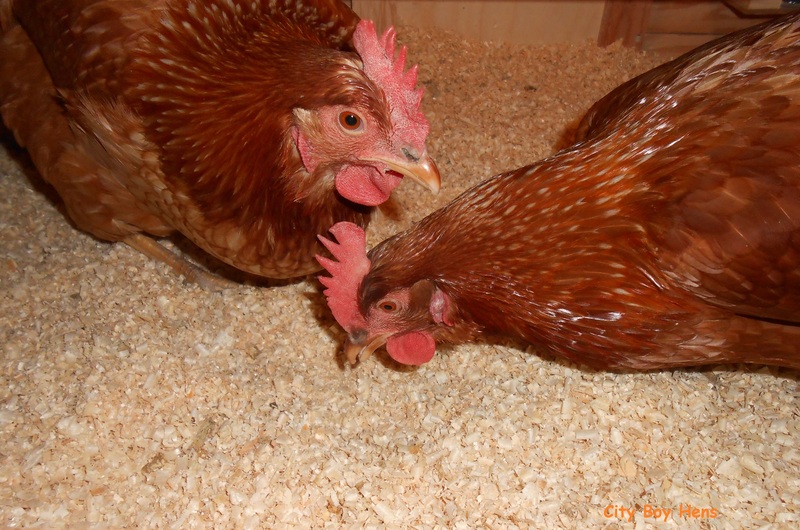 Grit should always be made available to your hens. They NEED it in order to digest what they eat. Chickens do not have a stomach and need grit in order to break down their food for proper digestion. 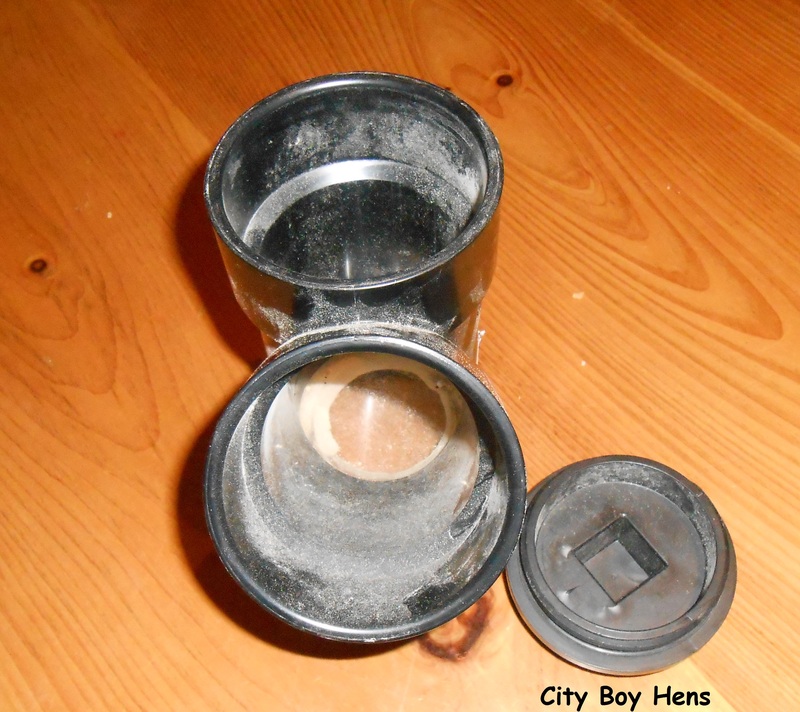 I also raise the grit cup off of the floor and always leave it out for the hens to take. It’s easy to forget about the grit because you will hardly have to fill it, but REMEMBER that it is essential. 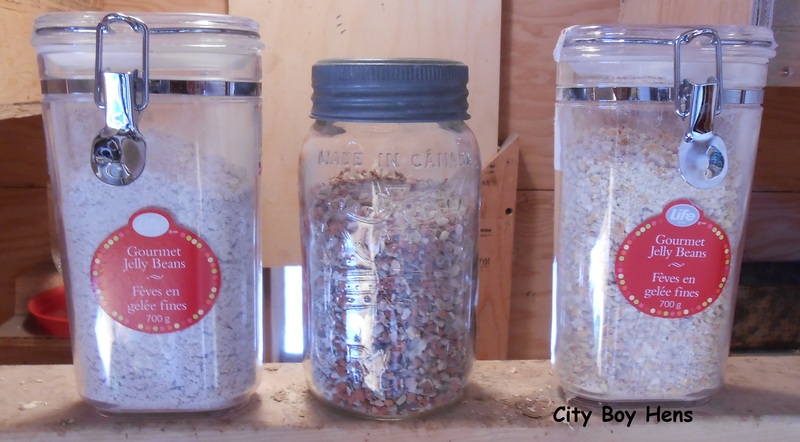 I leave my bulk grit container in an area in the shed with other essentials that I use every day. In doing so, I remind myself to check the grit cup from time to time. I have been told that oyster shell is not necessary because calcium is an ingredient in their feed. It must be because my hens’ egg shells are always hard. But….I do offer it “free choice” for the following reason: …….. At the cottage, the hens spend a lot of time free ranging. And where they spend a lot of their time is down at the shore picking in the sand. I finally discovered that what they were pecking at was broken down pieces of mussel shells. I put this to the test by offering them some mussel shell that I crushed into extremely small pieces. They devoured it in seconds and then proceeded to want more. So…They like it, I offer it. For $5/bag it’s worth it. I have heard scratch referred to as chicken candy. THEY LOVE IT. It consists of cracked corn, wheat and oats. It should only be used as a treat because it is high in calories. A fat hen does not make for a good laying hen. As well, it should only be used sparingly in warm weather because it increases metabolism and can cause unnecessary heat stress on your hens. In the winter, I throw a handful into the coop before dusk to help keep them warm through the night. It also adds as a good distraction which helps satisfy their need to scratch and peck for food. Scratch can also be used as a great training tool. I put some in an empty water bottle and give it a shake. When the chickens hear THAT sound they always come running. This is an effective technique for getting them back into the coop after free ranging. Chickens love eating and they will eat almost anything. 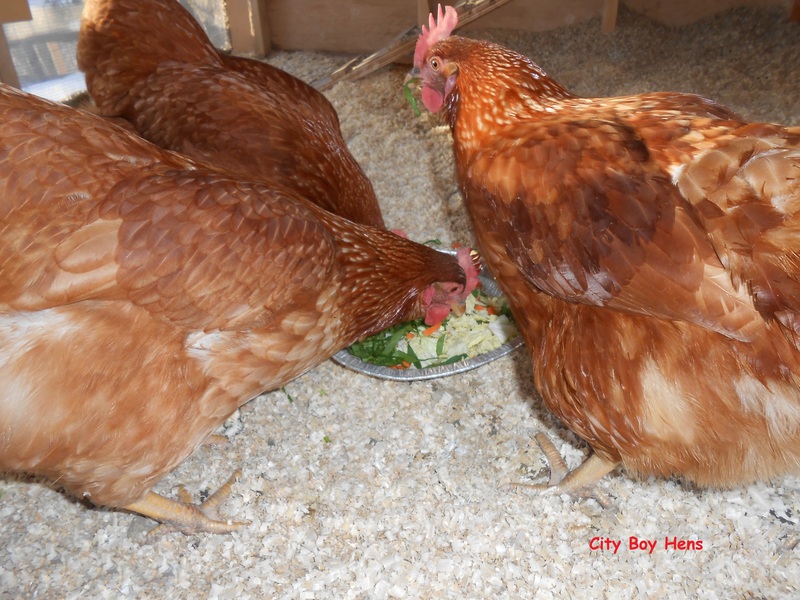 My hens LOVE eating tomatoes, spinach, carrots, cucumber and …….MEAT. They go nuts when I give them chopped up pieces of cooked beef, pork and……..dare I say……chicken. My daughter says that feeding them chicken is “forced cannibalism” but I remind her that I am not forcing anyone! 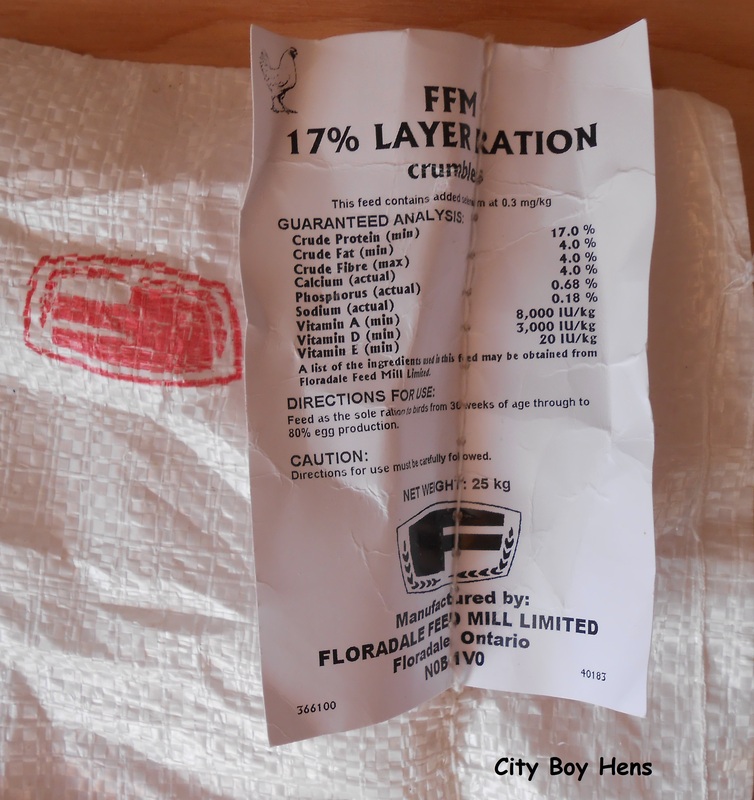 Remember……layer feed is the main course, fresh water every day, grit & oyster shell on “free choice”, some scratch on cold winter mornings/evenings, vegetable scraps on a daily basis and some cooked meat on occassion will make for happy, healthy, EGG LAYING hens!